For people who wish to treat moderate to severe nasolabial folds, or the deeper creases around the nose and mouth, consider Juvéderm Vollure™ XC. It is an FDA approved injectable filler that can make your face appear smoother and more youthful. It is one of the first and only hyaluronic acid dermal fillers approved for the correction of facial wrinkles and folds that lasts up to 18 months. Most fillers approved for this area last up to one year. Call us for a free consultation* with our skin care nurses today at (818) 284-4003. Vollure XC is a dermal filler made from hyaluronic acid, a naturally occurring substance in the body that helps keep skin plump and hydrated. It creates a smooth skin and helps minimize deeper creases while moving naturally with your facial expressions. 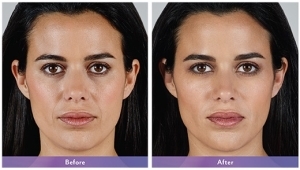 Areas Treated - Juvéderm Vollure® XC injectable gel is for injection into the nasolabial folds. 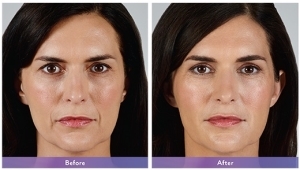 Results - Patients will experience smoother, plumper, younger-looking skin up to 18 months. After that, there will be a gradual diminishment of the filler. Some patients require repeat treatments before 18 months have passed. Recovery Time - Just after the procedure, patients can experience temporary swelling or redness. It may also last for most of the first day. Likewise, as with any injectable filler, there is a chance of bruising, particularly in individuals taking blood thinners, such as aspirin. Bruises typically resolve in less than a week. Your nurse or physician can educate you on how to avoid or decrease the likelihood of this happening. Ready to See a New You? If you’re ready to talk about a Vollure XC treatment, give us a call. Our cosmetic nurse specialists can offer you a free consultation. If you decide to proceed with the treatment, our experienced Burbank cosmetic physicians are extremely accomplished and knowledgeable doctors who have worked for years in the medical field. Advanced Dermatology Center has been helping people with an extensive range of cosmetic, medical, and laser treatments for more than a decade. Our doctors are certified by the American Board of Dermatology, which inspires confidence in the people we help. Contact us to make an appointment today. *Fees apply to all appointments with our doctors. We do, however, accept most major PPO insurance.